Onemana is a small beach resort with lots of bush, birds and secluded spots. There is a beautiful surf beach and lots of bush walks to remote neighbouring beaches. If you want a bit more action, Whangamata is only 10 minutes drive away. Other Coromandel attractions like Hot Water Beach and Cathedral Cove are only a hour away. 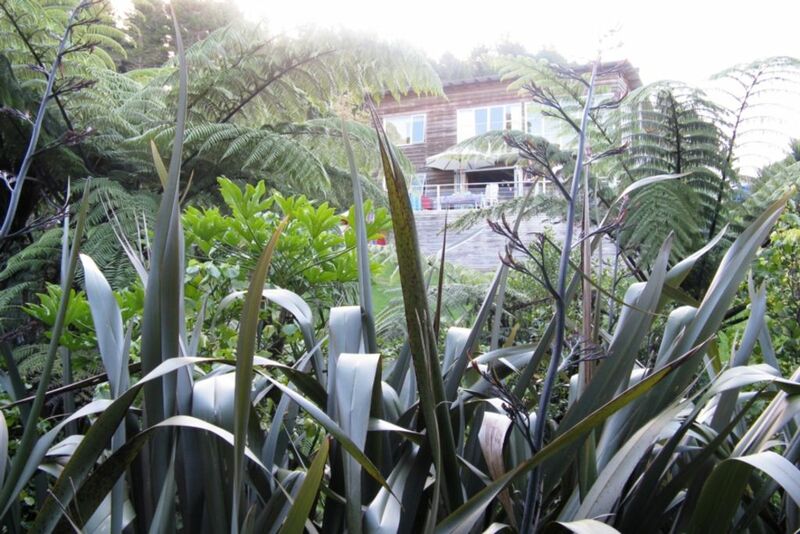 There are free tennis courts too if you can drag yourself away from the deck where you could sit for hours watching the Tuis and enjoying their songs from the bottle brush and Kauri or admire the Kingfisher sitting in the Punga. At night you can hear the Morepork calling and the crashing of the surf. It's an idyllic retreat from city life. In winter there's a roaring log fire to add to the ambience and comfort. The house has all the mod cons and is furnished in an eclectic mix of Kiwi and African design and art. Downstairs suitable for toddlers and wheelchairs. Enclosed/gated deck safe for toddlers and pets. Extras: Cleaning (Required, NZ$60.00 per stay); NOTE: Under Kiwi bach tradition you are expected to: Bring your own linen (towels/sheets/tea towels); although access to ours is possible on request if you are from overseas (at a charge of $100). We chose Onemana as the place to build our holiday home because we both lived near and loved a surf beach called Nahoon in East London, South Africa. Our bach is named after this beach and offers us a similar experience of a white sand surf beach, long summer days, lots of bush and birds and walks and family and friends - all the good things in life! Onemana cafe is great for breakfasts and more, Whangamata is 10 mins drive away for all your needs. You can see the sea from the deck, lounge and upstairs bedroom and hear the waves (when they are crashing). However the sea view is not expansive as we are surrounded by lots of trees and shrubs. cutlery, crockery, utensils, electric gadgets, breadmaker, blender, food processor, electric knife, tea pots etc. Enjoyed a thoroughly relaxing week in this very well equipped bach. Unwound the moment we arrived with books, backgammon and dinner on the deck, bushwalks, beach time and brunches in Whangamata and Tirua. It was all we wanted and more with the added bonus of being dog friendly. Loved it! Well maintained house with everything you need for a comfortable stay, outdoor shower very pleasant! Can’t wait to return to this awesome Bach. Had a wonderful holiday in a beautiful Bach. Lovely views from the deck, outside shower was a hit with the kids, a decent bbq/braai to tan your meat on!!! So pleased you enjoyed it and thank you for looking after it so well. You are welcome back any time. Unfortunatley a local mowing company called Mowtivated mowed lawns, weedeated and blew leafs for 6 hours on the Saturday and started again at 8.15am on the Sunday morning. they were still at it when we left at 11.00am. Really ruined an otherwise idyllic weekend. The Tui outside our window,the tranquility of the trees. This property was amazing, the right fit for my family. This property was amazing, the right fit for my family. Very close to everything you need. Onemana is a 10 minute drive from Whangamata with all the amenities, cafes, supermarkets, medical and dental services, vets etc.